Today we’ll tell you about our crafting system. Description will be divided into 4 parts. So, the first one is devoted to types of resources (raw materials, refining and materials). In Reign of Guilds resources are raw materials and materials (that can be refined from raw ones). Therefore refining system and economic aspect of the game are relative. We want to clear out that we don’t provide players tools for gathering directly. Those tools are used by NPC that can gather resources. And players can simply control those NPCs (as counts), take gathered resources and move them to refining station to take materials and move them to warehouse. 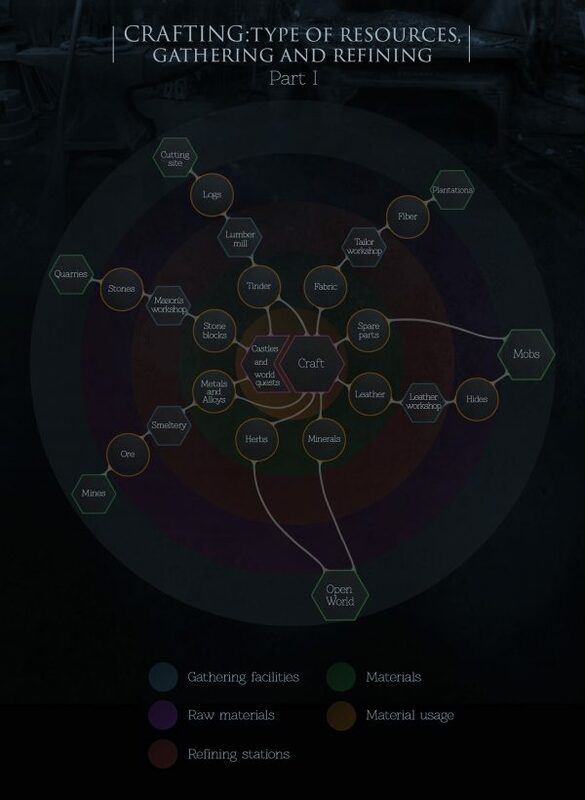 What should be mentioned is that as game is open world PvP oriented, system of gathering resources is closely connected with “caravan” aspect. Character’s weight capacity is limited and depends on stamina and weight of materials is close to realistic. Therefore, it isn’t very profitable to move resources on your back, so you’ll need to use baggage animals (that can be stolen by another players). Plantations Here one finds fiber that can be refined in textile factory that usually placed in cities. So fiber is one of the materials that should be moved as cargo on caravans. After refining, fiber turns into fabric that is used upon crafting. Mobs Open world mobs are good source of hide and “spare parts” (teeth, nails, blood, bones and so on). Those parts cannot be refined and can be used in crafting right away. However, hide should be taken to skinner in order to get leather that can be used in crafting. Open world Players can find minerals and herbs that randomly generated all over open world. Those resources don’t require refining to be used upon crafting. Mines In mines NPC can gather ore. Ore must be taken to smeltery which are placed in towns. Ore should be moved to smeltery via caravans. In smeltery ore refined into metal and alloys that can be used upon crafting. Quarries In quarries special NPC gather stones. Gathered stone can be refined in special stonemason building close to the stone mine (in 10 minutes walking through open world). After refining you get stone blocks that can be used when character repairs items and upgrade castles. Stone blocks can also be used to complete world quests or be presented to other player. Cutting site At cutting site NPC gathers logs. After gathering, logs can be refined to timber in lumber-mill that also placed near working lot. Timbers are used for crafting, maintaining and upgrading castles and finishing world quests. In this article we took into account all feedback you’ve shared. So we’ve tried to share information about raw materials and gathering/refining stations in short. In next article we’ll tell you more about count’s role in production sector of RPG world.